Sweet Music For Your Ears! Win A $250 Candy Shopping Spree! Step up to the mic, sing us a few bars, and you could win $250 worth of sweet treats! Break out some rap, get down with some rock-n-roll, or even kick back with some country. Maybe even wow us with your opperetta! 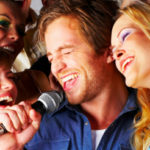 Go solo, do a duet, or get a group together! 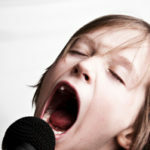 Get in tune with your taste buds, sing about your favorite bubble gum or gummies and candy bars too! Just make sure it’s about any candies you love! Three Shopping Sprees Will Be Given Away! 1. Anyone under the age of 18 must have parental concent. 2.You must upload your video on Youtube and tag it Blair Candy Free Candy Contest. 3. Send us the link to your video in a e-mail to contest@blaircandy.com . 4. Contest entries must be received by midnight August 14, 2009. 5. Winners will be announced August 18, 2009 at Blaircandy.com contest page. 6. Winners must agree for Blair Candy to use their video and name on our website and blog for public viewing. 7. Winners can spend their winning candy dollars on anything on our website. 8. Winner must spend all their winnings by December 31,2009. 9. Shipping charges will count in the dollar value of your candy orders. 10. Have fun and be creative ! We all know that many Candy Companies put a lot of time and energy into the packaging, taste and looks of candy, but is candy really all the same in the end? Well… not the Candy I had a chance to see being sold this past week! 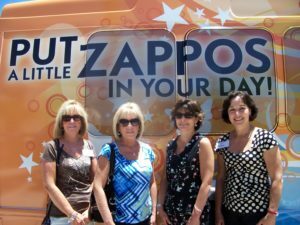 I was lucky enough while out in Las Vegas on business to get a tour of one of my favorite and very successful online shoe selling websites, Zappos. For years I have been following this company and admiring their style, great customer service and strong culture. From the very beginning of my correspondence about a visit, Missy Raley, Zappos help desk coordinator made the shoe fit even more!. Probably the most important and rewarding candy items they sell are located in vending machines in their free lunch cafeteria. They have vending machines full of all kinds of sweet treats for their employees and visitors, but they charge for these and donate the profits to a charity in Nevada. Now how sweet is that! Probably the only thing I couldn’t find in this ever expanding product company was shoe strings. Yes, they sell zillions of shoes, sneakers and boots that have them already preloaded, and even a few pocket books that tie shut, but I thought for sure I’d see some different colors of short and long shoe strings that people love to enjoy, just like our variety of shoe string candy laces. This company and its sweet culture for success is run by Mr Tony Hsieh. Tony jumped into this company with both feet, and even sits in his own cubicle not a four walled office among hundreds of other Zappos employees, like Missy who coordinates at the help desk and Heaven our devoted tour guide and even the big guy who heads up their fraud swat team.